It’s love again with our Savoir Faire beach wedding package. Have your wedding in all white…Simple & Elegant! Start off with our 4 posted bamboo arch either in natural tan. Then we’ll outfit it in gorgeous draping white fabric. This 4 posted arch looks stunning all in white, it’s simple yet very elegant. This package comes with one of our dedicated beach wedding officiants to perform your wedding day ceremony, vows and any special ceremonies. After the ceremony, we’ll get everyone up for a short walk to the waterfront for the popular “Shell Toss & Blessing,” a fun ceremony that gets everyone involved… Great Photo opportunity for you and all of your guests. Beach wedding site planning and coordination are included with this wedding package. We provide 10 of our white padded chairs, for cool comfort. Add professional wedding photography to be there & capture all the wonderful memories from your wedding day. 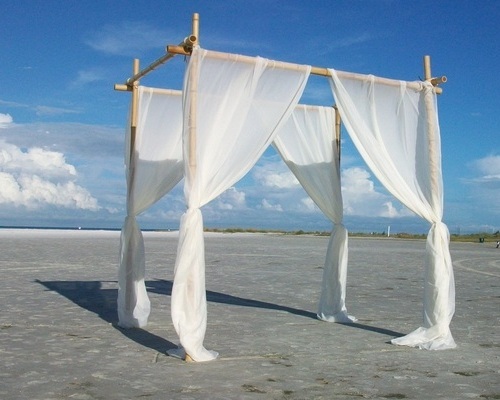 The Savoir Faire Beach Wedding Collection: Weddings, Vow Renewals or Commitment Ceremonies. *Credit/fee give-back on unwanted package items or services is not allowed.